All my dressmaking to date has been from new modern patterns. 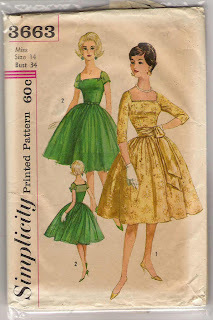 Although I've bought several vintage patterns from eBay, I've never quite gotten up the courage to make any of them up. I don't want to ruin a pattern or indeed, face the risk of making a haymes of it. Every so often I go browsing on eBay looking for vintage dress patterns. I love the models portrayed on the envelopes. They strike poses, while looking elegant and chic. I love this Simplicity 3663 pattern. It's a nice length and the bodice has a flattering neckline. Ijust know that I'd look great in this. It's a pity that this one is for a 34" bust. If only I could find a 38" version. I'd be so there!! However, then I'd be left with the problem of deciding which fabric would suit this best. Do I make it for evening wear or instead something more suited to daytime wear?